Image caption La biblia más antigua que se conoce ahora está disponible en internet. The world's oldest surviving Bible has been pieced together and made available on the internet. 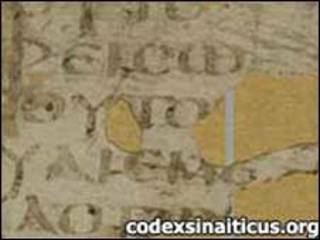 The 1,600-year-old "Codex Sinaiticus" was split up after its discovery in the 18th Century. Before the Codex Sinaiticus was compiled and bound less than 400 years after Jesus' crucifixion, most Bibles were written on collections of scrolls. The 1,400 parchment pages of the Codex - which was named after its discovery in Sinai - were scattered between St Petersburg, Leipzig, London and Egypt, but each page has now been digitally photographed and collected on a single web-site. 900 of the 16 by 14 inch pages survive, each bearing four neat columns of Classical Greek. Careful study reveals passages that have been questioned and altered repeatedly over the centuries. The British Library, which begins an exhibition of the Codex Sinaiticus today, said the book gave first-hand evidence of how the text of the Bible had been transmitted from generation to generation.